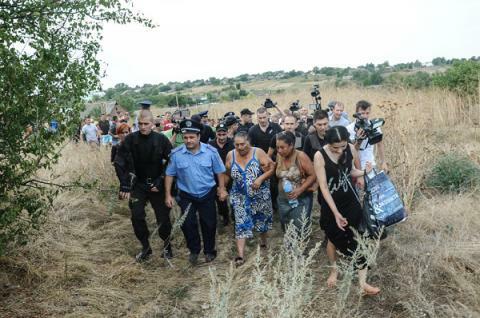 The community of the village of Loschynivka, Izmail District, Odesa region, have demanded that all gipsies be evicted from the village after the murder of an eight-year-old girl, presumably by a 20-year-old gipsy man. Several hundred residents held a local gathering, an Interfax-Ukraine reported. They asked rural council members, who were present at the gathering, to hold an emergency session to support the village's resolution. The session was held straight away, with the rural councillors supporting the resolution. Also, at the gathering, the residents learnt that three Roma women, who earlier left the village, have returned. Police had to protect them from attacks on the part of Loschynivka's female population. The situation in the village remains tense. There are grounds to suspect a Roma man in the murder of the little girl, an Odesa regional police spokeswoman said. Odesa regional police have arrived in Loschynivka to prevent further disturbances. Inquiries into the murder and disturbances are under way. Police have launched a murder inquiry under Article 115 part two of the Ukrainian Criminal Code. The gipsy man has been arrested and is expected to be remanded in custody. Also, a criminal inquiry has been launched into disturbances under Article 194 (property damage or destruction) of the Ukrainian Criminal Code.